You can rent floaties and pool toys from the resort. White brick and rustic fireplaces give residences a distinct Southwestern feel. Take a meditative trip around the labyrinth. You deserve a relaxing treatment at the spa. Play lawn games with the fam. 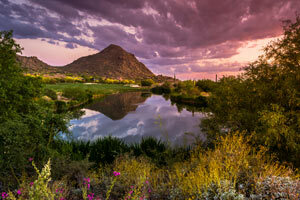 You're surrounded by the Phoenician Golf Club. Quaint townhome villas with old-fashioned street lamps set the mood. The Running Water Spa offers delicate massages and rejuvenating treatments. Choose from three well-maintained tennis courts. Sprawling on eleven acres, the townhome-style villas at Scottsdale Camelback Resort make for a peaceful family vacation. Play a game or get a rally going on the tennis courts.Challenge the kids to a game of mini golf or keep an eye on them while they enjoy the playground. After a fun day of golfing and nearby desert adventures, there’s nothing like relaxing next to the outdoor pool with a cocktail from the poolside bar. You can also hop on in for a cooling dip or a soothing soak in the whirlpool spa. Little ones will love splashing in the children’s pool. Fire up the bbq grills and make a batch of burgers. Get in a workout at the well-equipped fitness center and sink into pure relaxation in the dry sauna. Studio condos sleep four guests and two- to three-bedroom condos sleep, six guests. Escape the Arizona heat thanks to air conditioning. Full kitchens give you the freedom to cook everything from Kraft macaroni to a four-course meal. Start the morning with your famous chocolate chip pancakes and let the kids assist with mixing the batter. Don’t worry if things get messy; you’ll have an in-suite washer/dryer. Watch a sitcom rerun or a movie on the flat screen TV; it has cable and a DVD player. If you really want to get fancy, take advantage of the on-site movie theater for family movie night. Private patios are perfect for watching the sunset. Gather the family and take in the view. Bring the family along to Scottsdale Fashion Square Mall for a day of shopping. Little ones will love Build a Bear, where they can build their very own stuffed animal souvenir. Department stores include Dillard’s, Nordstrom, and Macy’s. Make a pit stop at Starbucks for a latte and surprise the kids with a Cinnabon. For apparel, check out American Eagle, J. Crew, and Tommy Bahama. Need a new handbag? You’re in luck! There’s Kate Spade, Louis Vuitton, or Coach. Treat yourself to a new piece of jewelry from Pandora or Tiffany & Co. Hungry? There’s Johnny Rockets, Shake Shack, or Charley’s Philly Steaks. Baseball fans will want to visit Salt River Fields at Talking Stick. It’s the spring training home to the Colorado Rockies and the Arizona Diamondbacks. Test your luck at Casino Arizona at Talking Stick. It features eight-hundred slot machines, fifty table games, and poker tournaments.